Najib reveals bank documents on RM304.5m Saudi donation | Daily Express Online, Sabah, Malaysia. 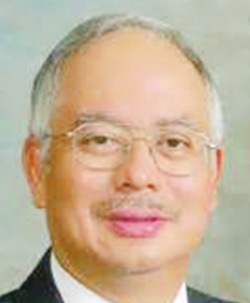 Kuala Lumpur: Datuk Seri Najib Razak (pic) released documents that he claimed proved the Saudi Arabian royalty donated US$100 million (RM304.5 million) to him in 2011, as he promised to explain soon other donations, including the controversial RM2.6 billion.In a posting on his Facebook page, the former Prime Minister published several documents detailing several transfer of funds into his personal bank account from one Prince Faisal Turkey Al Saud totalling US$20 million and US$80 million from Saudi Arabia's Ministry of Finance, as well as a letter from Saudi Prince Abdul Aziz Al-Saud. "In view of the friendship that we have developed over the years and your new ideas as a modern Islamic leader, I hereby grant you a sum of United States Dollars One Hundred Million (USD100,000,000) Only ("Gift") which shall be remitted to you at such times and in such manner as I deem fit," Abdul Aziz was quoted saying in the letter dated Feb 1, 2011, addressed to Najib's Duta residence. "You shall have absolute discretion to determine how the Gift shall be utilised and I am confident that your actions will continue to promote Islam so it continues to flourish. This is merely a small gesture on my part but it is my way of contributing to the development of Islam to the world. "This letter is issued as a gesture of good faith and for clarification, I do not expect to receive any personal benefit whether directly or indirectly as a result of the Gift. The Gift should not in any event be construed as an act of corruption since this is against the practice of Islam and I personally do not encourage such practices in any manner whatsoever." The letter from Abdul Aziz expressed how the Saudi royal family were impressed with Najib's work in leading a Muslim country using Muslim principles. It also detailed the importance in introducing Islam to the world following the Sept 11 attacks in the United States, and how the Saudi royal family were impressed with Najib's suggestion to form the Global Movement of the Moderates during the United Nations general assembly in New York in 2011. The scanned documents provided by Najib showed a US$10 million (RM30.5 million) deposit that was made into Najib's account on Feb 23, 2011, another US$10 million (RM30.2 million) on June 13, 2011, a sum of US$49,999,988 (RM148.8 million) on Aug 18, 2011, and an additional US$29,999,988 (RM95 million) deposited on Nov 25 the same year. The exchange rates used varied across transfers. According to the documents, the transfers had come from Saudi Arabia's Ministry of Finance and from one Prince Faisal Turkey Al-Saud. Najib had also in his post explained the Saudi royal family had made the donation following the uprising of the Arab Spring in late 2010 among Muslim countries in the Middle East and sections in Africa. "The late King Abdullah had also made it a point for the donations not be published for mass consumption. "However, considering I am no more the Prime Minister, and King Abdullah has passed on, I feel the time is right for me to reveal these documents to vindicate myself from the accusations and slander," he said in the posting. "The money was used to purchase several vans for Umno in Johor, but unfortunately those vans have been auctioned off by the Pakatan Harapan government," he said. Najib, 65, is facing seven criminal charges over funds belonging to SRC International totalling RM42 million, namely three CBT charges, one charge of abuse of power and three charges of money laundering. He claimed trial to all the charges and was released on RM1 million bail with two sureties. Najib had, in his posting, included that future Facebook postings, or possibly interviews with the media, would further reveal contributions he had received over the years beginning 2011, including the controversial RM2.6 billion allegedly misappropriated from state investment firm 1Malaysia Development Berhad (1MDB).